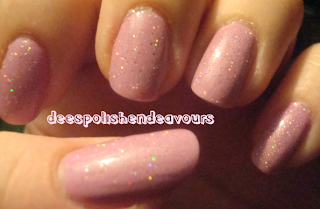 Juli (aka shortnails) at Shortwidenails asked me to do some swatching using CG Fairy Dust. Of course I was more than happy to oblige her request. 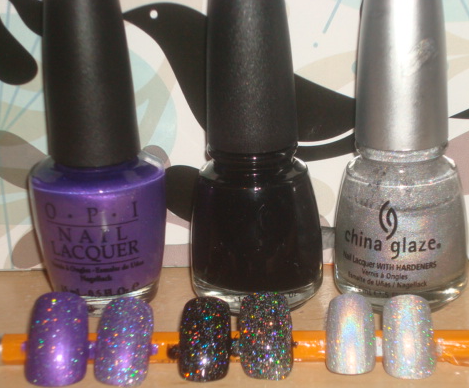 She asked to see it over OPI Purple With A Purpose, a black (I used CG Liquid Leather) and CG OMG. As an added bonus, I will show it over OPI Lucky Lucky Lavender as that is what I am currently sporting.. I know, no nail art, craziness!! I am lazy and my allergies are killing me!! So, as you can see, it is a multi-coloured sparkly dust.. And for once my sub-par photo skills are actually a benefit.. I especially love the last photo, unfocused multi-coloured glory at its finest! 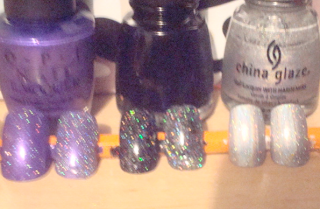 Now on to my nails.. The colour is Lucky Lucky Lavender, but seriously, I don't see too much of the lavender-y (aka purple, in my mind) side, I see a stellar barbie pink. Like I seriously want to bust out some barbies and load them into the barbie van.. Too far? Most the people at work today just loved it.. Oh, and I know you can see some air bubbling, I was in a bit of a rush when applying the polish and Fairy Dust. The residents that usually call my nails 'too wild' thought this was amazing.. Then one of my faves was like 'it is nice, but for you? it is kind of blah..' I told her I adored her.. She gets it! When I first put it on, I hated it against my skintone, I thought the blue tone within the polish made my hands look some weird unhealthy shade of yellow instead of my usually transparent. Now after a few days, it isn't too bad.. My mom really wants to use this combo for her toes now.. Ugh. And last, but not least, I had to include this photo.. It is just.. Awesome. 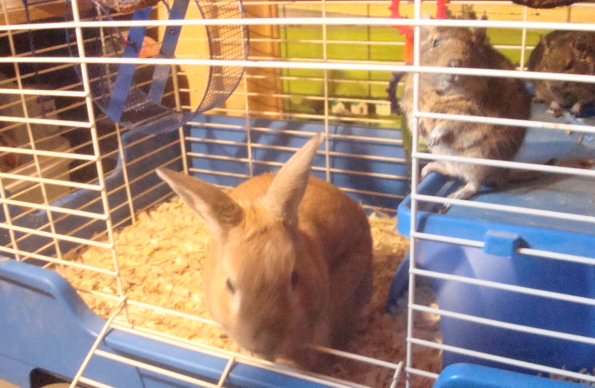 So, we had our only male rabbit, Fonze, up on the work bench, and he was wandering around Bennie and Jet's cage.. 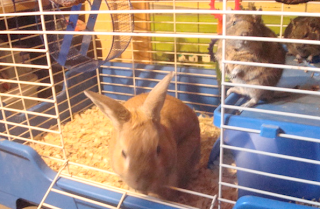 Which was fine, we had the cage door open, but they weren't really too interested.. Until Fonze just leaped into their cage. He stayed for quite awhile, and to my complete shock, they all got along. Oh, and you may notice their wheel is just mid-air, well, see the platform they are on? There used to be one over there as well. They are chewers to the max. I am looking into wooden slats for their cage. Rascals I tell ya! Ok, I will silence myself now!! I should probably go take some allergy meds and rest! I hope everyone will have a super weekend - I will catch up on answering comments next entry. See you all next week! you are so fast at replying! Thanks so much for the swatches. Now I know that I NEED to get fairy dust. 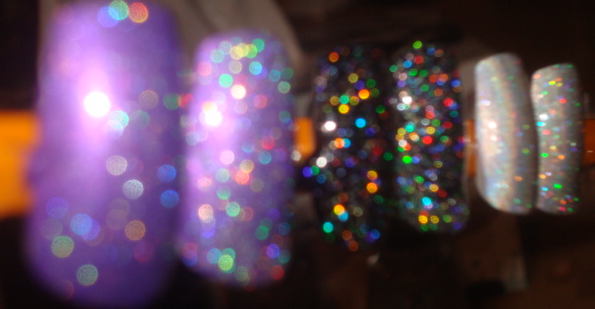 It is a very awesome color/ glitter. I'm so glad you did a one coat versus 2 coat. once again. thank you so much!! now I know that I need this polish. 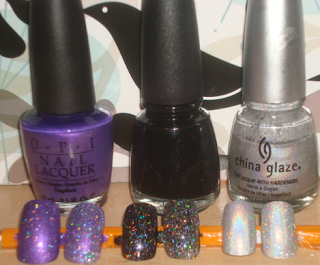 I have a similar polish like this which is called gabrini.. I love it more when its layered on dark polish..